SIXTH COLUMN: Protestors Want Citizenship NOW!!! While a divided Congress wrangled over how to solve the immigration crisis, advocates of illegal aliens yesterday denounced all of the major legislation under consideration, along with President Bush's proposals, demanding in protests throughout California that they be given full citizenship now. Protest organizer Luis Magaña in Stockton, Calif., condemned the president's guest-worker proposal, contending a similar program run from 1942 to 1964 was abusive, the San Francisco Chronicle reported. "If a program doesn't give us the full rights accorded other workers in the United States, then we're against it," he told the paper. "They haven't spelled out the details and there's no discussion with the people who will be affected." Activists in several California cities held news conferences yesterday to denounce legislation under consideration in the Senate and passed by the House and to oppose the president's call to deploy National Guard troops on the border. Democratic Sen. Dianne Feinstein's office in San Francisco was the site of one rally that featured signs and banners reading "Do Not Militarize the Border" and "No Human Being Is Illegal." The protesters said they would continue until senators hear their message. The Mexican government, meanwhile, warned it would file lawsuits in U.S. courts if National Guard troops detain illegals on the border. "If there is a real wave of rights abuses, if we see the National Guard starting to directly participate in detaining people ... we would immediately start filing lawsuits through our consulates," Foreign Secretary Luis Ernesto Derbez said in an interview with a Mexico City radio station, according to the Associated Press. What bothers me? Their demands irk me. The fact that mot of the people cut in line in front of others that have patiently waited to enter and have gone through an assimilation program, bothers me. The refusal to learn English annoys me. 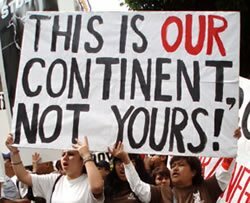 Even though we speak, write, and read Spanish, English is the official langauge of the United States, and migrants shouldn't set a policy to change this nor any other policy. The demand for policy changes is more than irksome. That American officials, seemingly guided by officials in foreign governments, are caving in on this extortion and blackmail is troubling. I don't know about you. I didn't vote for officials in Mexico and resent their meddling. Rest assured that the "new citizens" will care more about what officials in Mexico think and say and will exert pressure on American politicians to do the will of the Mexican people. Mexican officials and elite should improve conditions in Mexico and American officials should look out for present American citizens, not the possibility of "new citizens", the majority of whom want to use the United States for their own interests, "paper citizenship", and have no desire to assimilate and to be an American patriot.